Bring joyful moments into the lives of your dearest ones with this Superb Stationary Set with Disney Mickey Design and let them cherish it for lifetime. This Disney Stationary Set is arranged with Disney Mickey Pencil Box. 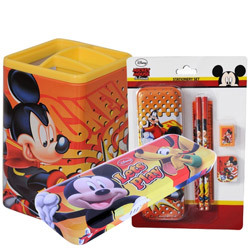 This Set also includes an attractive N colorful Mickey Designed Pen Holder and One Disney School Set containing 2 Pencils, 1 Ruler, 1 Eraser, 1 Sharpener, 1 Pencil Box.